In today’s competitive and very appearance conscious world, many people are aware that their smiles are not as attractive as they would want them to be. Often poor dental appearance ages people completely unnecessarily! • Are you afraid of needing a lot of invasive dentistry (crowns) that will permanently damage your own teeth? • Do you believe the cost will be massively prohibitive? • Do you think the procedure will take lots of time and several appointments? • Are you scared that the dentistry will hurt? • Do you think that any changes will look false and you will lose your character? 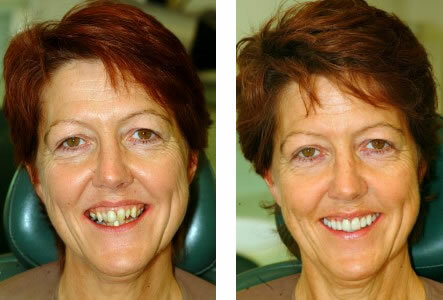 • Have you ever asked a dentist of your smile makeover choices and/or it’s never been offered? 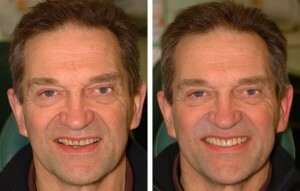 In most cases, with advances in modern cosmetic dentistry, you can get a smile makeover in one day. Great results can be achieved by using an experienced dentist or prosthodontic specialist and none of the above need apply! Obviously each case is different and, without doubt, any appropriate smile makeover treatment options need to be individualised and costed. Many people have teeth that are far from perfect. They may have a large number of fillings or be discoloured. Teeth may be worn down or misaligned (crooked). Their teeth may well be healthy; they just don’t look attractive and are negatively affecting the smile. Very often, the appearance of such teeth can be corrected with the use of some subtle reshaping and veneering applying tooth coloured material onto the outside surfaces of teeth in what we call the smile zone. Two types of materials are commonly use, quartz composite and porcelain. You can enhance your smile with a single visit in the caring hands of our specialist prosthodontist Dr George Druttman who has created thousands of smile makeovers over many years. 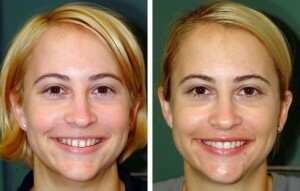 Smile makeover options: composite or porcelain? Composite veneers are completed by the dentist in one same day appointment. Although they cannot be considered as permanent as porcelain, the treatment tends to be less invasive and is far less costly. They require more maintenance (polishing up during regular checkup/ hygiene visits), yet they can often last 4 to 8 years. Moreover they are easily repaired, should a bit chip off. Very often such treatment does not even need a local anesthetic. A smile makeover with porcelain veneers is the optimal material, being much harder and longer lasting than standard composite. It requires a significantly greater financial investment as the restoration is made in a dental laboratory and consequently needs a second visit a week or two later. To talk with our smile makeover specialist or to book an appointment just click here.